Victor Gillam’s Judge cartoon of November 19, “Prepare to Deliver,” depicted a childish Cleveland whose election as president had left him vulnerable to the dictates of Tammany Hall, the powerful Democratic political machine of New York City. A week later, this Judge cartoon by Grant Hamilton shows Cleveland as the willing partner of Tammany “boss” Richard Croker in the shady business of trading political offices and favors. 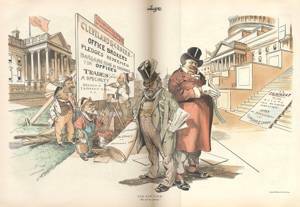 The two figures appear in the center foreground as confidence men (i.e., swindlers), while a billboard announcing the opening of “Cleveland & Croker Office Brokers” is being posted by the firm’s workers (left-right): Edward Murphy, chairman of the New York State Democratic Party; Lieutenant Governor William Sheahan of New York; Charles Dana, editor of the New York Sun; and Vice-President-elect Adlai Stevenson, who adds a finishing touch.